Lawyers in all sorts of courts argue heartless positions every day without fear of reprimand from a judge, who may also be heartless. The admonition from Judge Garaufis is an anomaly filled with hope, not least because he was admonishing the Trump administration for its heartless immigration policy. Specifically, the judge was chiding lawyers from the US Department of Justice for the government’s rigid unwillingness to adjust their schedule ending the DACA (Deferred Action for Childhood Arrivals), the program designed to provide justice to some 800,000 immigrants who were brought to the US as children and have grown up here to be as American as anyone else. Judge Garaufis pointed out that the government’s heartless action affected more than just the 800,000 young people, but also their families, employers, and communities. Before the Brooklyn court issued its injunction, the US had appealed the California injunction to the Supreme Court. When two federal district courts disagree, the Supreme is more likely to intervene to settle the differences. Here, two federal courts were in agreement. On February 26, the Supreme Court declined to hear the DACA case, allowing it to proceed in district court and, as needed, federal appellate court. The Supreme Court made no ruling or comment on the merits of the DACA case. 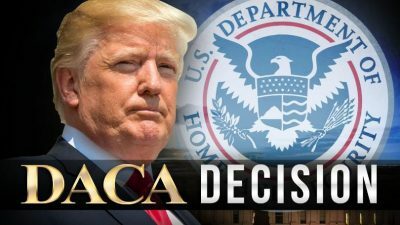 The Supreme Court’s decision leaves DACA in place as the legal process proceeds, perhaps until it eventually reaches the Supreme Court on appeal at some unknown date in the future. On March 29, in Brooklyn federal court, Judge Garaufis ruled against a US motion to dismiss the case. He rejected the US Justice Department argument that, just because the president repeatedly makes racially and culturally bigoted remarks – like calling Mexicans thugs, animals, and bad hombres – that doesn’t prove his actions against minorities are based on his bigotry. Again, in lay terms that means that when a known bigot does something obviously bigoted, then perhaps his bigoted action is derived from his expressed bigotry. Just maybe. Do we really want to be the kind of country needs its courts to enforce common human decency? That’s the kind of country America seems to be these days, and it’s taken a good deal of time to get here. At a time when the Congress is filled with quisling Republicans and feckless Democrats, it appears as a slightly hopeful sign when some courts put at least some check on the president’s cruel destructiveness. The people affected by DACA are very different from our president, not least because they were not born into a rich family of practicing racists. The president’s decidedly un-Christian burst of twitter spittle over Easter weekend offered no hope. “NO MORE DACA DEAL,” he spluttered all in caps before going on to claim a fever-dream “caravan” of immigrants swarming across the border was somehow true (along with others like “DACA is dead because the Democrats didn’t care or act, and now everyone wants to get onto the DACA bandwagon… No longer works. Must build Wall and secure our borders with proper Border legislation. Democrats want No Borders, hence drugs and crime!”). Bigotry is soul-destroying for everyone, as our bigot-in-chief in the White House demonstrates almost daily. To be a decent nation within the norms of common decency and the intent of the US Constitution, we must resist and reject bigotry in all its forms. But for hope to be realized, a lot more of us need to bring the callous politics of bipartisan cruelty to an end. There may or may not be light at the end of the tunnel for any of us. There is a hint of light at the end of the tunnel for DACA, but there may only be the Supreme Court at the end of the tunnel, a court where many parties have pleaded positions that are heartless and the court has affirmed their heartlessness. This article was originally published on Reader Supported News.